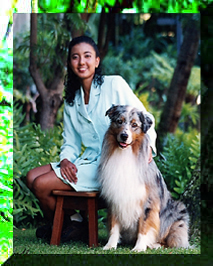 Aloha and welcome to Aumoehoku Australian Shepherds located in Waianae, Hawaii. We intend to be active and responsible breeders. Our aussies are not for sale on a first come first serve basis or to the highest bidder. We look for the best home we can find. Our first Aussie came to us in 1991 when I started my teenage life at thirteen years old and have had a Aussie ever since. Our first show Aussie came to us in 1996 as a high school graduation gift so I gave conformation a try and managed to finish my first show Aussie to her AKC Championship. Then I got addicted in showing and conformation.